iviva Smart BIM is a subscription based cloud service that brings buildings to life by combining the power of Forge and IoT thereby radically changing how smart buildings are operated and tenant services are enabled. Further, it protects the investment made in making Autodesk® Revit® or other BIM files. iviva Smart BIM turns BIM files in your BIM360 Docs into an operational portal, which enables you to walk through the 3D model and access systems and equipment along the way. 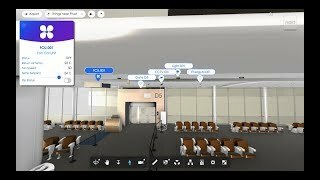 Iviva Smart BIM is a live dashboard, which highlights ‘things’ that need your attention by masking the noise, for example, where currently active incidents are or where available meeting rooms are. iviva Smart BIM abstracts out important operations of your systems and equipment by hiding the complexity of individual makes and models. You can turn on air conditioning and change temperature setting right on the 3D canvas without having to know the details of systems and equipment. iviva Smart BIM is highly extendable to adapt to specific project requirements. Extend user interface to enable customized monitoring and operations, or introduce more information filters, or build interfaces to 3rd party IoT devices on your own.